A friendly driver will collect you from your hotel approximately 30 minutes before takeoff and transport you in air-conditioned comfort to the helipad, about 5 kilometers outside of town. After a safety briefing you'll take off for an epic journey over one of the continent's most spectacular attractions. 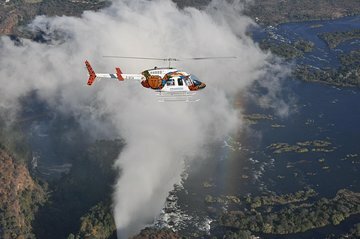 See the thundering falls from above and catch a glimpse of the raging Zambezi River from the sky. Choose from a 13 or 26-minute flight and enjoy a video and still presentation--with the possibility of purchase--post adventure. Your experience concludes with a return transfer to your hotel.